In some ways, cats and dogs are the ultimate Paleo devotees: they get plenty of sleep, they don’t have any stressful day jobs or mortgage bills to worry about, and they’re perfectly happy to shun Oreos and ice cream for a bowl full of meat. But not even our pets can completely escape the damage of the modern lifestyle, and the number of pets struggling with obesity and chronic diseases his risen as our furry companions are increasingly confined to tiny apartments, fed a steady stream of processed, canned food, and subjected to the same stressors as their owners. The consequences of the modern lifestyle are largely the same in pets as in humans. Domestic animals are increasingly overweight and inactive, and cats and dogs are even developing diabetes in ever-increasing numbers. This isn’t just a problem for the pets – their owners are also missing out on all the joy of a healthy companion. Domestic animals are a great complement to a Paleo lifestyle, because they help improve your mood, reduce stress, and even work more physical activity into your day. One common rule of thumb for Paleo grocery shopping for humans is to stick to the perimeter of the grocery store: don’t venture into the middle aisles, which are full of canned, boxed, and jarred food products full of preservatives to keep them fresh at room temperature. Unfortunately, those middle aisles are also where you’ll find the pet food, and the same disadvantages apply. Commercial cat and dog food is loaded with grains, legumes, and chemicals of various different kinds: it’s basically the animal equivalent of Lunchables. And unsurprisingly, pet Lunchables aren’t any better for them than human Lunchables are for us. Cats are obligate carnivores – they’re hunters by nature. In fact, they’ll actually die on a strict vegetarian diet, because they need a dietary source of several nutrients and amino acids that are found only in animal products, like taurine and certain B vitamins. 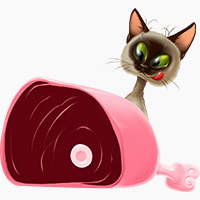 Cats can survive on vegetarian kibble if they’re also fed supplements for these essential nutrients, but there’s no reason to add artificial supplements to keep your pet alive on an unnatural diet, when you could just feed it the food it was designed to eat: meat. Dogs should also eat a meat-based diet, but since they’re naturally omnivorous, they should also eat a wide variety of other foods, including bones, vegetable scraps, and other miscellaneous foods. While there are some foods that dogs absolutely shouldn’t eat (including Paleo delights like macadamia nuts and avocados), they do thrive on a varied diet of raw meat and vegetables, without any of the cooked grains and legumes of conventional puppy chow. If you’re interested in switching your pet to a Paleo-style diet, it can be tempting to change everything right away, but putting Fluffy on a Whole30 isn’t the best way to make the switch. Like kids, pets should be eased into their new diet – gradually increase the amount of real food in your pet’s diet, and decrease the amount of store-bought food, making sure to watch for any signs of digestive upset, or other signals that you should take things even more slowly. Many people warn against a diet of raw meat for fear of E.Coli or other bacteria. Certainly, poisoning your dog is the last thing you want to do, but remember that cats and dogs, unlike humans, are biologically designed to eat raw meat and have a digestive system built to minimize the risk. Carnivores have a much more acidic digestive system, which eliminates many food-born pathogens that would infect a human. It’s more likely that you might get E. Coli from touching your pet’s food, but this is easily preventable by taking the same hand-washing precautions as you would with any raw meat, and by cleaning your pet’s dishes thoroughly with soap and hot water. While cats and dogs thrive on a meat-based diet, other pets are naturally herbivores. Birds vary widely depending on species – budgies eat grains in the wild, while parrots can eat an astonishing variety of food including fruit, vegetables, nuts, small insects, seeds, and even flowers. This doesn’t mean that you can just let your pet bird clear the plates after dinner, though; the best way to develop a Paleo-style diet for a bird is to do research on the specific species and try to imitate its natural diet. Other types of small pets, like rabbits, ferrets, guinea pigs, rats, and mice, also do better when they’re not relying on modern processed pet foods. There isn’t nearly as much research done on raw diets for smaller pets as there is for cats and dogs, so you’ll have to do a little more experimentation to find out what works. A good place to start your research is by looking up what your pet eats in the wild, and slowly introducing those foods into its regular diet, making sure to keep a close eye out for any digestive symptoms. Unfortunately, good pet food, like good people food, is also significantly more expensive than processed junk, so a Paleo diet for your pet can come with a bit of sticker shock. Buying an entirely meat-based diet for a large dog can cost almost as much as buying food for another person, and for some people, it might not be in the budget at all. But even if Fluffy isn’t eating the finest grass-fed liver off a silver platter, you don’t necessarily have to stay with whatever you can find at Wal-Mart. Any step away from the grain-based commercial pet foods will be a bonus for your pet, whether it’s moving to a grain-free brand from the supermarket, an even more Paleo brand sourced from grass-fed cows, or an all-meat diet. Some people also compromise by supplementing Paleo-friendly pet food with occasional raw meat and bones. You can also keep the cost down by stocking up on cheap cuts of meat when they go on sale. Since your pet will be eating the meat raw, it’s fine to include bones (cooked bones are brittle and dangerous, but raw bones aren’t, and they’re a great source of calcium), so turkey or chicken necks and backs make great budget-friendly pet meals. Try a variety of meats, including fish, raw eggs, and organ meats – and if you really want to treat your pet, US Wellness Meats carries a line of gourmet treat options including delicious, chewy marrow bones from grass-fed animals. Along with feeding your pet the best diet that you can reasonably afford, it’s best to provide plenty of species-appropriate exercise options. Dogs love to run around with their pack – many larger dogs will happily jog with you or even run alongside a bike. Throw a ball around in the park, enjoy some dog-on-human tug of war, or see how long it takes you to destroy a Frisbee. This is not only physically healthy for your pet, but also great for resolving behavior and obedience issues. Just like people, dogs aren’t designed to lie around the house all day without a break: they’ll be less stressed and happier if you take them outside to play. If dogs are famous for their sociability, cats are known for exactly the opposite attitude: not even the most luxurious Paleo diet will make most cats want to catch a tennis ball, much less come out with you for a jog (although there are always exceptions!). But that doesn’t mean they don’t need regular physical activity in their lives. Toys that encourage the cat to move and jump around are great ways to stretch your cat’s muscles, and safe places to jump and climb (like well-balanced scratching posts) can also help keep kitty occupied while you’re away. Paleo doesn’t just help your pets – companion animals can also help you stick more closely to a Paleo lifestyle by reducing your chronic stress burden. There’s a reason so many nursing homes have caged birds or fish tanks in the common areas, or a few cats wandering the halls: interacting with pets has been proven again and again as an effective method of stress reduction in humans. Pets help reduce the suffering of people living with chronic diseases (including mental disorders like depression and anxiety), the elderly, and anyone else experiencing or recovering from traumatic events. But even if your biggest stressor is a demanding academic advisor or a micromanaging boss, owning a pet can still help you relax. Exercising with your pet will also help you incorporate more low-intensity movement into your day, and even get some Vitamin D from the sunlight, if you play outside. It’s also a great opportunity to make some human friends and bond over something that doesn’t involve food. Social groups can often be challenging for Paleo dieters because they all seem to revolve around a plate of cookies, but a daily chat at the dog park is allowed on any kind of diet. The upshot is that if you have the resources to support a pet, animal friends are a great source of support and companionship, and fit naturally into a Paleo lifestyle. 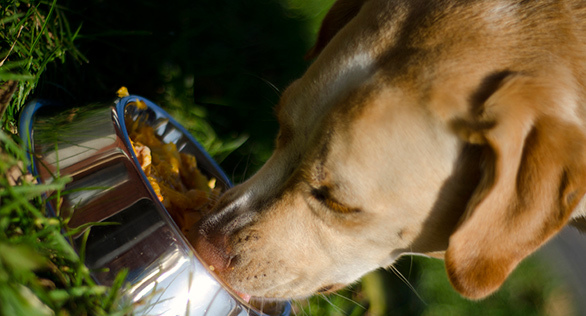 It’s best to feed your pet its natural evolutionary diet (which will vary, depending on the type of pet), but if you have to compromise with commercial kibbles, or a mix or kibble and raw food, there’s no reason to beat yourself up over it. After all, most humans don’t eat 100% cheat-free Paleo, and we still see the benefits of following evolutionary principles, so do what you can within your time and budget constraints, and enjoy the companionship of a healthier, happier pet.